This title is from the first lines of a poem/prayer I first heard from my Mom as a little boy. This is more an invitation than an article for readers. 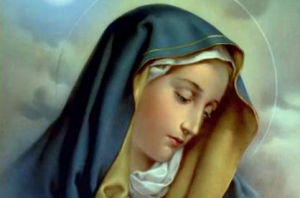 Please speak your thoughts in comments below about how Mary, today, would teach us how to pray. Syllabus: This is an introductory course and will define prayer, trace the development of prayer since the Annunciation, and encourage students to themselves engage in prayer. As a final class project, each student will prepare a prayer and pray it for the class. The instructor has over two thousand years experience in prayer, beginning at a very young age, and is known worldwide as an expert in the field. She will commute from Heaven each week for these classes. Sadly, we cannot sign up for such a course. We are, however, blest with what is in Holy Scripture about Mary, her very own prayer, Church tradition about Mary, and many writings of the Church Fathers. Putting aside for the moment the debate about the origin of Mary’s prayer, whether or not she even said it, and accepting at least that its sentiments and feelings are those of Mary, there are some things about the prayer that provide insights into how Mary prayed. The remainder of the prayer is in the first chapter of Luke’s Gospel. In addition to Mary’s words quoted above, other than these grateful, some worshipful, humble statements, the bulk of the prayer is about God, not Mary. Nowhere else in Holy Scripture does Mary speak at such length. We do not know, e.g., what she said, or prayed, or cried out at the foot of the Cross. So, there is much we can learn from her Magnificat about how to pray. Now, back to the original question about the title above. We have Mary’s prayer and can pattern prayers on how she prayed, but what would she would say to us today? What we would think and what we would say to the Christ Child would be how Mary would have us pray. Myself, I know I would begin speechless, and then, in sorrow, I would think how could I ever hurt this Child. And I would not want to hand Him back to His mother.